Windows 8 is currently in its consumer preview, and aside from being g-g-gorgeous, it's also going to be home to a lot of beautiful new Metro-optimized apps through the Windows Store. Which are the best? Which do you need to download first? 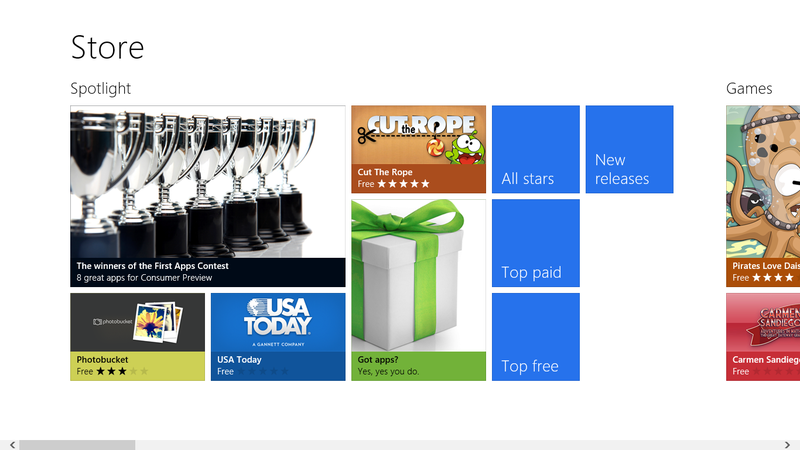 Here are the most essential Windows 8 apps on day one. Let's be up front, the Windows Store is barren right now. There's just nothing there yet, a rough count pegs the number of apps at less than 100, and you'll obviously need to download Windows 8 before you can nab even those. But you know what makes it worth it? During the preview period, every app in the Windows Store is free. Yup. FREE. So even though there aren't that many apps, there aren't any apps that'll cost you any money. That's a win. Here are the best we've found so far. Wordpress: Got a blog? Chances are you built it with Wordpress. And if you want to share stuff to your Wordpress blog from your snazzy new Windows 8 tablet/computer, you'll probably want to use the WordPress app. It lets you to browse orignal content on Wordpress.com and share photos, links, and quotes from any app. Free. Ashampoo ImageFX: If pictures are worth a thousand words, then pictures tweaked with effects and filters are worth EVEN MORE. Okay, maybe not, but all the cool kids are making their pictures look snazzy these days so you might as well too with Ashampoo ImageFX. SketchBook Express: You've heard of SketchBook on other platforms, but now it brings its drawing expertise to Windows 8. It doesn't pack quite as many options as SketchBook Pro but you can still draw with a variety of tools: pencil, pen, airbrush, etc. Grantophone: Turn your Windows 8 device into a musical instrument (great for tablets, especially). You can tweak settings to create sounds to pretend you're the digital age Mozart or a technologically inclined Dr. Dre. Vimeo: No app from that other video sharing site yet but it's okay, Vimeo videos are always higher quality, always more fulfilling and always more tasteful. Well, almost always. Either way, watch videos on Vimeo. Pirates Love Daisies: An addicting tower defense game that puts two things you don't think fit together (pirates and daisies) and make it super fun to play. The original game was actually built with HTML5, so this Windows 8 version runs swimmingly on any device. Cut the Rope: The premise of the game, if you've been living under a rock, is to feed Om Nom his candy by cutting ropes in strategic fashion and also gathering as many stars as you can. Trust me, it's not as boring as it sounds. You'll be addicted in no time. Wordament: It's an addictive word game in the lines of Boggle. You get a grid of letters and you find as many words as you can from adjacent letters. The game pits you against other players in real time so you get to see how quick your finger is, and how vast your vocabulary. Elements Weather Forecast: You can't always stay inside; sometimes you'll have to venture out to the big bad world. When you do, it's good to know the weather. Elements gives you 7-day forecasts, 3-6 hour forecasts, but most importantly you can pin a live tile to your homepage. That way you can keep tabs on the forecast without having to jump into the app. Evernote: Evernote, the do-everything-and-anything note-taking app, is also available for Windows 8. It syncs with all your other Evernote apps and works just as you'd expect: write notes, search notes, map notes, share notes, etc. Dictionary.com: Words. Don't play around, we all know that you don't always know what they mean. Dictionary.com will tell you. Essential, right? And very cromulent. Cookbook: Cookbook taps into 200,000+ recipes from Big Oven and shows you delicious pictures and full cooking instructions for everything from main dishes and sides to bread and desserts. You'll become a Michelin starred chef soon enough. USA Today: Keep up with the news of America with USA Today. Sure, it might not be my go to source for news, but it does cover everything pertinent in easily skimmable nuggets and will let you easily keep track of the news on your Windows 8 device. LA Times: The LA Times is a solid newspaper with a horrible website (those ads, ugh). So how is the LA Times app? Surprisingly good! The Metro interface works really well with news, showing images and stories as grabby tiles. MSNBC: Keep track of all of MSNBC's content—from Today to the various blogs under its umbrella—with the Windows 8 app. And like every other Windows app, the MSNBC app makes everything a lot mo' pretty. Kayak: Sometimes it seems like the internet can make traveling even more of a hassle, what with all the different rates to sort through and confirmation numbers to manage. Kayak actually makes the process easier—from booking your flights and hotels to organizing your itinerary. See any other great apps that we missed? Let us know in the comments!